Why is another theory of evaluation needed? The paradigm wars have left a void in their wake. A new theory, firmly grounded in a credible philosophy of science, is needed to guide practice. The aim of this volume is to provide a new theory that captures the sensemaking contributions from post-positivism and the sensitivity to values from constructivist traditions. The theory presented here is not a slap-dash synthesis of the competing paradigms--it is a new approach. Some of the contributions of the realist theory of evaluation are (1) providing a basis for principled discovery as we oscillate between explanations and data; (2) using explanation as a means for extrapolating findings from one evaluation to other settings; (3) viewing all methods, both quantitative and qualitative, as aids to sensemaking that have strengths and flaws; (4) connecting evaluation practice with the ultimate goal of most program evaluation--social betterment; and (5) balancing the focus of the evaluation between sensemaking and value inquiry. This is the 78th issue of the quarterly journal New Directions for Evaluation. GARY T. HENRY is professor of policy studies and political science at Georgia State University. GEORGE JULNES is Visiting Research Specialist at the Institute for Public Affairs, University of Illinois at Springfield. MELVIN M. MARK is professor of psychology at Pennsylvania State University. 1. A Realist Theory of Evaluation Practice (Melvin M. Mark, et al.). 2. Evaluation as Sensemaking: Knowledge Construction in a Realist World (George Julnes & Melvin M. Mark). 3. 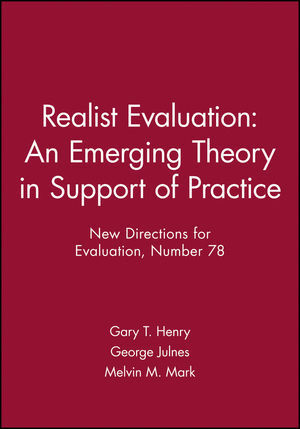 Values and Realist Evaluation (Gary T. Henry & George Julnes). 4. Social Programming and Policy-Making: A Realist Perspective (Melvin M. Mark & Gary T. Henry). 5. A Realist Theory and Analysis of Utilization (Gary T. Henry & Debra J. Rog). Epilogue: Experience Informing Theory Supporting Practice (George Julnes, et al. ).